In one of the worst industrial accidents of the 21st century, thousands of Rana Plaza garment factory workers were buried alive making clothes for some of the world’s richest corporations. To date, all major multinational companies with confirmed ties to the Rana Plaza factory have contributed to the Rana Plaza Arrangement compensation scheme for the victims -- except Benetton. As citizens of the world, we urge Benetton to join the scheme, so survivors of this horrific disaster receive full compensation. 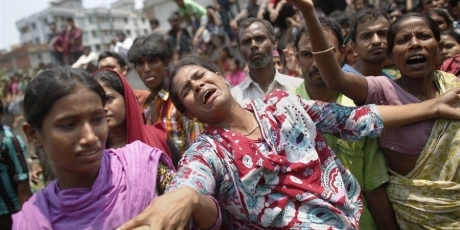 In just 90 seconds, an eight-storey sweatshop in Bangladesh collapsed. 1,134 people died. Some survivors sawed through their own limbs to escape. Out of the horror, the UN set up a ground-breaking compensation and corporate accountability scheme. Incredibly, it’s working -- but survivors need our help to get one complicit company to pay up. Billion-dollar Italian clothing giant Benetton refuses to compensate the victims who made their clothes. It’s the only major global brand with undisputed links that hasn’t contributed. So far, they’re ignoring survivors and will get away with it unless it impacts their reputation. That’s where we come in. Benetton is prepping for Milan fashion week. It’s Italian fashion’s most important event of the year -- and our opportunity to create a massive PR scandal. Click to demand Benetton pay up now and save this scheme. When we get to 1 million signers, we’ll embarrass them in a spectacular fashion week show they can’t ignore. Sign now.